Straight from the Koadiak Lab we have a new BCAA Intra Workout supplement to check out. 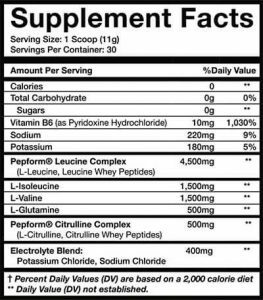 This ain’t your traditional 5g of 2:1:1 ratio BCAAs, it has a bunch of extras as well as a rather large dose of BCAAs with the promise to address that time between pre and post workout. Kodiak Ammo is coming in a 30 serving sized Tub with each serving being a recommended 1 scoop of (11g) We are getting full disclosure from the team at Kodiak as always. Which makes our job nice and easy. Right away we can add up those active ingredients giving us a very nice 81%. It’s a good start so Let’s BREAK IT DOWN! Isoleucine is another BCAA that stimulates muscle protein synthesis, but less when not combined with the other BCAAs. However, Isoleucine significantly increases glucose uptake and the usage of glucose during exercise; leading to greater energy production. L- Valine promotes muscular endurance and decrease fatigue during workouts. It lowers the amount of serotonin that gets to the brain; leading to stronger muscular contractions, quicker recovery and also prolonged muscular strength and endurance. L-glutamine is the most prevalent free amino acid in plasma and one of the most prevalent found in muscle tissue. It stimulates muscle protein synthesis and is also effective at replenishing energy for muscles which can help a faster recovery. L-Glutamine can also increase cell volumization that leads to increases in muscle hypertrophy. L-Citrulline: Citrulline is crucial in the production of arginine and nitric oxide. It has been known to relax blood vessels, improve blood flow and lift overall nitric oxide levels. Bodybuilders use citrulline with their pre and post workout drinks to help improve recovery, increase vascularity and improve muscle pumps throughout the day and following a training session. Potassium: Potassium is a mineral found in almost all foods.It is needed for building strong bones. And can also help control calcium amounts in the body and urine. Sodium: Sodium a necessary electrolyte that you loose in your sweat. It regulates blood volume, blood pressure, osmotic equilibrium and pH. It may also slow down the onset of cramping during intense exercise. At a high 81% of Active ingredients and ZERO carbs and sugars the Label is off to a good start. Then we have a 3.1.1 Leucine ratio which is higher than the clinical 2.1.1 ratio we are use to seeing. That’s a massive 7.5gm of BCAA in 1 scoop. Although We are under dosed in the CITRULLINE COMPLEX blend which is a disappointment. Also missing something to help with endurance. Kodiak AMMO is available in 3 flavors. Sweet & Tangy, Rainbow fruit, Sweetish Punch, Geeky Grape, Star Punch & Cherry Candy. We tried Rainbow fruit flavor which has a really awesome taste! And also mixes very well with a little foaming. Actually, it tastes much better than most of the BCAA products out there! 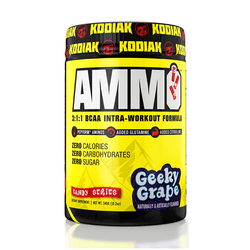 KODIAK Ammo is listed at $49.99 for a 30 serving tub. Which is A LOT of money for a BCAA. The best way to get a great deal on Ammo or any other supplement, is to keep on checking our site, as we continue to hunt down the best deals for everything fitness. Is it THE BEST Intra Workout BCAA we’ve seen? We think not. It’s really missing some key ingredients. Nothing in here for muscle endurance. And a VERY low dosage of L-citrulline makes it less than ideal as a Intra workout supplement. Anyway the bottom line is it has some Good parts and equally lacking in ingredients as well. At this price point you have a long list of alternative BCAAs to look at like Scivation Xtend and BPI Best BCAA just to start with. NOT SURE YET? CHECK OUT OUR BEST 10 INTRA WORKOUT SUPPLEMENTS FOR 2017. SEE THE HOTTEST BCAA SUPPLEMENTS DEALS FROM AROUND THE WEB!